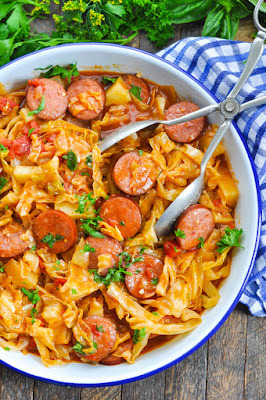 You only need one pot and about 10 minutes of prep for this easy Dump-and-Bake Sausage and Cabbage Dinner! The hands-off recipe is a cozy and delicious meal for busy nights! Preheat oven to 400 degrees F. Spray a large Dutch oven (or other oven-safe pot) with cooking spray. 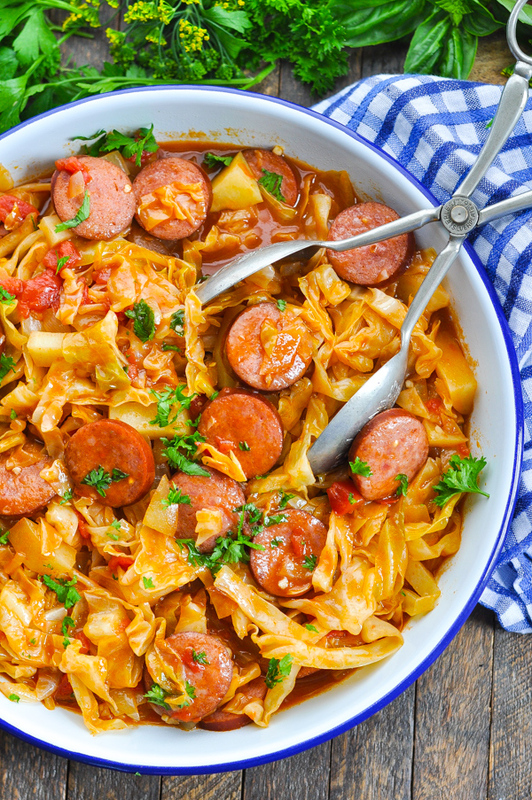 Place cabbage, onion, potatoes, sausage, garlic, salt, and diced tomatoes in the pot. In a separate bowl, whisk together balsamic vinegar, chicken broth, and condensed soup. Pour over cabbage mixture and gently stir to combine. Cover with a lid and bake for 45 minutes, or until vegetables are tender. I like to stir the pot halfway through the cooking time just to ensure even cooking. Cooking Just for Two? Cut the ingredients in half and prepare the dinner in a smaller baking dish. The rest of the cooking instructions remain the same. 0 Response to "DUMP-AND-BAKE SAUSAGE AND CABBAGE DINNER"